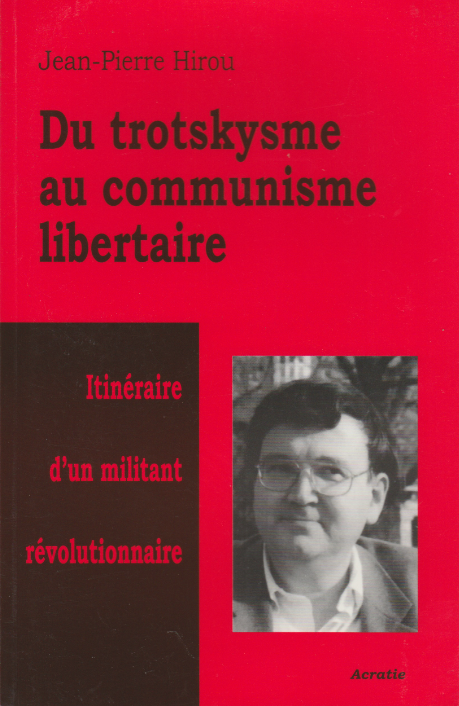 A short biography of French former-Trotskyist leader of Lutte Ouvriere Jean-Pierre Hirou who, like Michel Ravelli, became a libertarian communist. Born in Paris, Jean-Pierre became politicised in 1963 at the age of 15, whilst studying at the Lycee Condorcet. He joined the Trotskyist group Voix Ouvriere, which changed its name to Lutte Ouvriere in 1968 after being proscribed by the French government. At Nanterre University in 1968 he made the acquaintance of Jean-Pierre Duteuil, anarchist member of the March 22nd Movement, and comrade of Daniel Cohn-Bendit (whilst Cohn-Bendit has long renounced his revolutionary positions, Duteuil remains a militant, active in the Organisation Communiste Libertaire-OCL) Duteuil was later to be his editor. Jean-Pierre was involved in all the street fights that VO/LO engaged in when Stalinist thugs attempted to block their access to factory workers, when fascists invaded university campuses, and when the police truncheoned demonstrators on anti-Franco demonstrations. He was director of LO in the 70s and in this capacity, was responsible for its weekly paper. He wrote many articles on the political and social situation in France, on the international situation, and on the history of the workers movement. In 1973 he became professeur de lettres-histoire in technical teaching and met Michele who was also an LO militant, who became his life companion. Jean-Pierre was never comfortable with electoralism, In the national election in 1979, LO backed a vote for the leftwing candidate best placed in the second round of the poll. Jean-Pierre was disgusted by this, and rejected the opportunism of LO but also the authoritarianism of its leaders. He and Michele left LO. Jean-Pierre started moving towards the anarchist movement and started calling himself a libertarian communist. He was convinced of the need for a revolutionary organisation, but in the absence of any moves to unity among the several organisations in France, he did not feel the need to join any of them. He always argued strongly for maximum revolutionary unity. He was a member of the Cercle Daniel Guerin during its two years of existence between 1989 and 1991 (this group was established to ensure publication of Guerin’s writings). He wrote a number of articles for Courant Alternatif (monthly paper of the OCL) and for Alternative Libertaire (monthly produced by the group of the same name). In 1989 he collaborated with the Groupe Pierre Besnard of the Federation Anarchiste to collect testimonies for the book May 1968. This consisted of accounts from people who had participated in the events two decades before. He also made contributions to the broadcasts of Radio Libertaire, the Federation Anarchiste radio station covering the greater Paris area. In 1995, Acratie (the publishing house of the OCL) brought out his book on revolutionary syndicalism Socialist Party or CGT (1905-1914). He had just finished a translation of this work into Spanish and was looking for a publisher when he died. He died on 3rd November 2001 after suffering a stroke at the age of 53. Acratie have produced a collection of his articles From Trotskyism to libertarian communism, which appeared in 2003. These texts witness his lack of sectarianism, and his advocacy of revolutionary unity, even if limited or local.